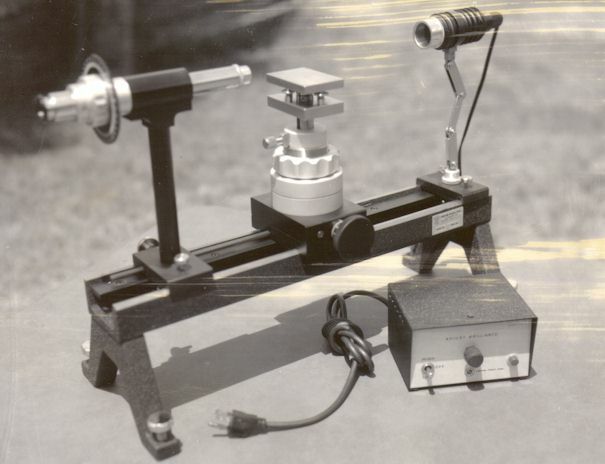 For over four decades the classic ramé-hart Model A100 and later 100-00 was referred to as the NRL goniometer. And rightfully so: it was the brainchild of Dr. William A Zisman of the Naval Research Lab's (NRL) Chemistry Division where it was born in the early 1960's. Dr. Zisman was a man of incredible genius and a pioneer in surface chemistry. He was by training a physicist but became enthralled in the exciting developments in the arena of surface science -- following in the footsteps of Langmuir, Rideal, and Harkins. His passion was so great that in 1938 he actually quit his job in Washington for a year and personally financed a year of study in the laboratory of the late Dr. Goranson at the Carnegie Geophysical Laboratory. The following year he successfully lobbied for a research program in surface chemistry and was hired to steer that program at the Naval Research Lab, later heading up the entire Chemistry Division. While at NRL, Dr. Zisman developed the vibrating condenser method of measuring contact potential, a method that has been widely used since then. In fact, he did his master's thesis on this topic at MIT. He also did significant work on oils and during the war he made many important observations that led to the development of synthetic lubricants and additives. Perhaps no one of his era made greater contributions to the vast collection of excellent data on contact angle, wettability, surface tension, and adhesion. He was the author of over 100 publications and his name was on nearly two dozen patents, mostly for lubricants and protective treatments for surfaces. He also authored Zisman's Plot method which is incorporated in our DROPimage software. In 1963 he received the Kendall Award from the American Chemical Society for his vast contributions to surface science. Here at ramé-hart, our particular appreciation for Dr. Zisman's contributions are somewhat biased and focused on his design of the ramé-hart NRL goniometer. Although the instrument has been redesigned several times over the years, there are a number of components that are still in use today. We continue to use the same standard 3" wide by 2" deep leveling specimen stage from the original design although the leveling hardware is now much easier to negotiate. The 3-axis stage of our Models 300 and 500 are essentially the same as the original model A100 stage attesting to the time-proven design of Dr. Zisman. The optical bench was converted from the original U-rail design in favor of our current ceramic-coated rails and Frelon bearings. Our new design wears better and longer and supports a more flexible load. The backlighting system has also changed. The original incandescent bulb mounted in a housing with an aperture has been replaced with far superior LCD and halogen technology. Our current illuminator is powered via a fiber optic bundle connected to an independent light source. Our Model 120-F0 uses our newer LCD technology. The optical subsystem has changed the most. 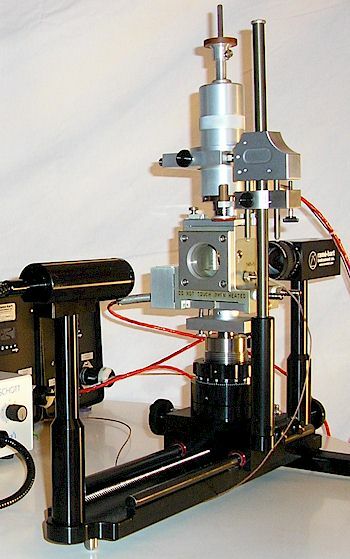 The original NRL goniometer used a microscope for visual measurement of the drop dimension and contact angle. All of our goniometers now employ a digital camera and our DROPimage software to capture and analyze the drop shape and profile as well as a measure the drop dimensions, contact angles, surface energy, surface tension, and other important values. If Dr. Zisman were around today, he would be pleased with what his creation has become. There are over 3000 ramé-hart goniometers in use throughout the world. No other manufacturer of contact angle instruments has a wider world-wide market presence or richer history in measuring contact angle, surface energy, and surface tension. We wish to thank all of our loyal customers who helped make 2007 our best year in many. All of us at ramé-hart instrument co. wish to extend our warmest greetings to you for a joyful Holiday Season with happiness and prosperity throughout the coming year.